There is some confusion on the Internet in which the partridgeberry is known also as the lingonberry. Although both are edible, they are not the same plant despite the close resemblance. A partridgeberry’s ripe fruit forms from the pair of flowers therefore it shows the two markings on each berry, this is unique and distinctive. 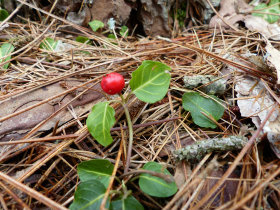 Partridgeberry is in the Madder family (Rubiaceae). It is distinguished from other woody vines by its small size, pairs of showy white flowers, and long-lasting red berries. 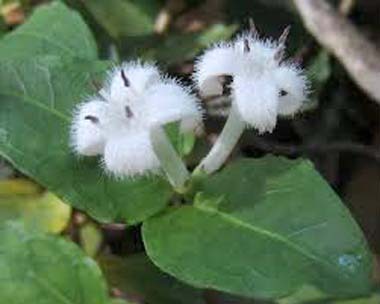 Distinguishing Features: This is a low trailing sub-shrub with fuzzy white flowers that grow in pairs forming one red berry per pair. The stems are mostly light green to light brown and either glabrous or hairy; old stems become brown, smooth, and woody. Flowers: Pairs of upright flowers occur at the tips of branches or from the axils of leaves. Each flower has a hairy white corolla about 1cm long, 4 stamens, and a pistil with a single style. Each pair of flowers share the same short-tubular calyx. 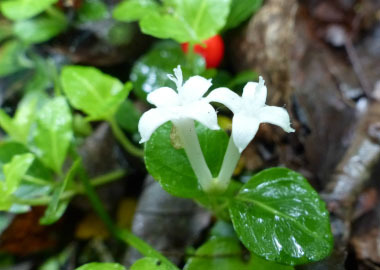 The flower is trumpet-shaped with 4 spreading lobes, while the calyx is light green with tiny teeth along its upper rim. The blooming period occurs from late spring to mid-summer and the flowers are fragrant. 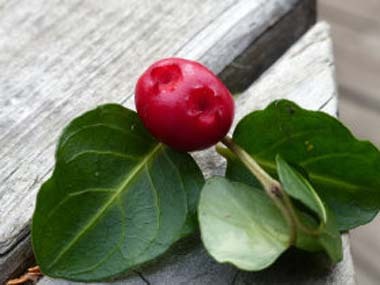 Fields of Nutrition has medicinal benefits and vitamin/mineral content of Partridgeberry. 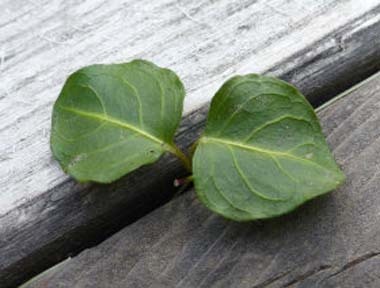 Leaves: Pairs of opposite leaves occur along the stems on short petioles up to ½ cm long. The leaves are ½ to 3cm long and similarly across; they are oval in shape and smooth to slightly undulate along their margins. The upper leaf surface is glabrous, shiny, and usually dark green. It is nearly white along the central vein and some of the lateral veins. 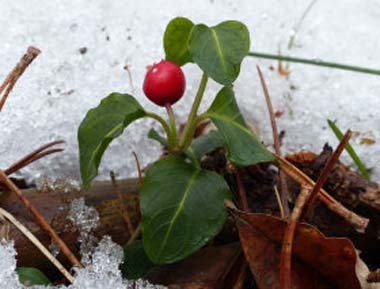 Height: Partridgeberry forms a low mat of evergreen leaves up to 10cm tall and 30cm or more across. Habitat: Habitats include rocky upland woodlands, sandy savannas, slopes of wooded sand dunes, sandstone ledges along ravines, mossy boulders in wooded ravines, edges of red maple swamps, and bogs. This plant is found across a wide area of eastern North America. Edible parts: The leaves and berries are edible. Leaves are typically made into a tea. The berries can be used in any culinary dish although they taste rather bland. High in vitamin C, tannin, anthocyanins and antioxidants these berries have been known to play a huge role in our health including the prevention of certain forms of cancer.